A flock of snow geese taking flight. Photo by Chris Darimont (raincoast.org). Snow geese are medium-sized geese (1.6-3.3 kg and average wingspan of 138 cm) with two colour morphs. The more common white morph has a white body, head, and neck, with black wingtips that are most visible in flight. Juvenile white morphs have dark bills and feet, and greyish colouring. The darker "blue morph" has a white head, brown body, and underside of tail. Juveniles have dark bills and feet, and dark heads and necks as well as bodies. The adults of both morphs have pink feet and bills, and their bills have a "grinning patch" - a dark line that gives the illusion of black lips. These geese are found in large flocks, from a few dozen individuals up to several hundred thousand. Snow geese breed in the high Arctic tundra, and winter in coastal wetlands, grasslands, and grainfields in areas of the United States and Mexico. Some populations winter in coastal North America but breed in Siberia or Greenland. Snow geese have three main migration paths across North America - one along the west coast and two through the centre of the continent. Look for the white morph in wetlands and fields along the coast of BC in the fall and spring migration months; the blue morph is only rarely found in more western areas of the species' range. The most similar goose species, Ross's Goose, is not found in British Columbia. Trumpeter swans winter along the Central Coast of BC; they are larger than snow geese, have distinctive black bills and faces, and have all-white wings. 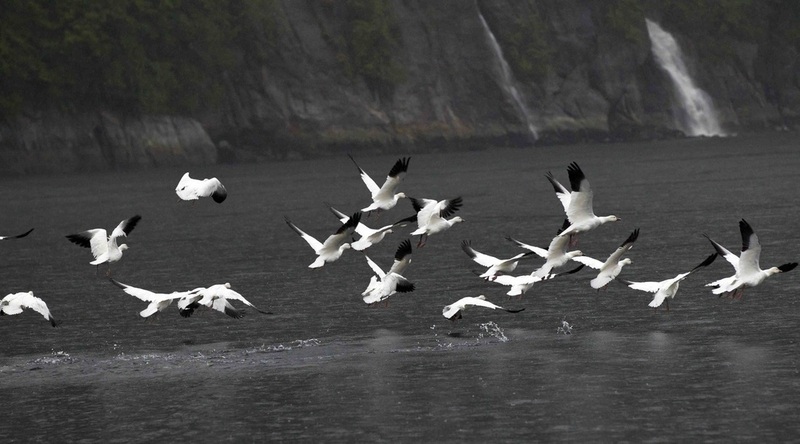 Snow geese are hunted for food. Hunting in the eastern US was illegal from 1916 to 1975 because of low population levels. Snow goose migrations consist of long flights broken up by long stopovers along the way. A single gene distinguishes the darker blue morph from the white morph. Blue is partially dominant over white, so the offspring of a blue morph and a white morph will have blue morph colouring, possibly with white bellies. Dunn, J. L. and Alderfer, J. (Eds.). (1999). National Geographic Field Guide to the Birds of North America. (3rd Ed.). Washington, D.C.: National Geographic Society. Pp. 70-71. Snow Goose. The Birds of North America Online (A. Poole, Ed.). Ithaca: Cornell Lab of Ornithology. Retrieved from the Birds of North America Online. Accessed 02/01/2014.